(Nanowerk News) Most of North America’s megafauna — mastodons, short-faced bears, giant ground sloths, saber-toothed cats and American camels and horses — disappeared close to 13,000 years ago at the end of the Pleistocene period. The cause of this massive extinction has long been debated by scientists who, until recently, could only speculate as to why. A group of scientists, including UC Santa Barbara’s James Kennett, professor emeritus in the Department of Earth Science, posited that a comet collision with Earth played a major role in the extinction. Their hypothesis suggests that a cosmic-impact event precipitated the Younger Dryas period of global cooling close to 12,800 years ago. This cosmic impact caused abrupt environmental stress and degradation that contributed to the extinction of most large animal species then inhabiting the Americas. According to Kennett, the catastrophic impact and the subsequent climate change also led to the disappearance of the prehistoric Clovis culture, known for its big game hunting, and to human population decline. In a new study published this week in the Journal of Geology ("Nanodiamond-Rich Layer across Three Continents Consistent with Major Cosmic Impact at 12,800 Cal BP"), Kennett and an international group of scientists have focused on the character and distribution of nanodiamonds, one type of material produced during such an extraterrestrial collision. The researchers found an abundance of these tiny diamonds distributed over 50 million square kilometers across the Northern Hemisphere at the Younger Dryas boundary (YDB). This thin, carbon-rich layer is often visible as a thin black line a few meters below the surface. Kennett and investigators from 21 universities in six countries investigated nanodiamonds at 32 sites in 11 countries across North America, Europe and the Middle East. Two of the sites are just across the Santa Barbara Channel from UCSB: one at Arlington Canyon on Santa Rosa Island, the other at Daisy Cave on San Miguel Island. 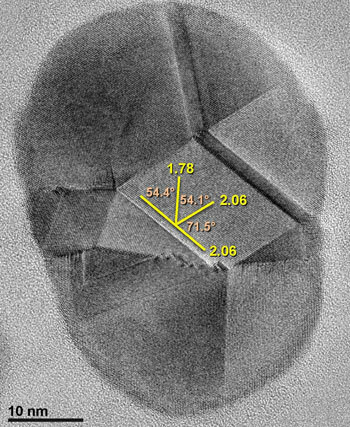 A transmission electron microscopy image of an unusually large, multiply twinned n-diamond or flawed cubic nanodiamond with 20 conjoined crystals from Kangerlussuaq, Greenland. Based on multiple analytical procedures, the researchers determined that the majority of the materials in the YDB samples are nanodiamonds and not some other kinds of minerals. 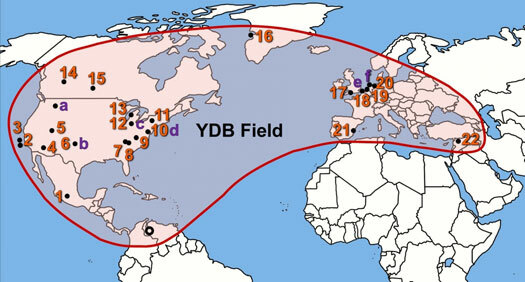 The analysis showed that the nanodiamonds consistently occur in the YDB layer over broad areas.